When choosing fabric, consumers look for more than just physical appearance. They want value for their money and will often consider textile durability over the physical appeal. The durability of fabric is determined by its ability to retain its shape even after constant wear and washing. The resilience of the fabric: Refers to the fabric’s ability to bounce back into shape, even when it is wrinkled. Tensile strength: This is found in the fibers that are used to make the fabric. 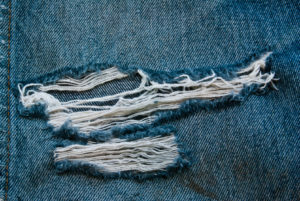 Abrasion resistance: The ability of fabric to withstand friction applied to it through washing and rubbing. Aramid, nylon, polypropylene and polyester are some of the fibers that possess the highest tensile strength. They are also the preferred picks in making durable knitted products and others that are to be used in high-traffic places. The fiber can either be used on its own or blended with others to produce superior products that will last the test of time. Various factors determine how we shop for fabric. Do you want to use it as a decorative piece? Which area of the house are you buying the fabric for? High traffic areas such as the living room require fabric that can stand up to plenty of movement. Therefore, the fabric for upholstery in this area should be able to resist the constant friction. Gone are the days when durable fabric was characterized by drab colors and stiff, waxy material. The modern models are fine-textured with cheerful patterns. This makes them appealing to the eye, but also able to withstand the distance of time. Just look at the color of upholstery in restaurants and homes. It is evident that quality does not equate to boring design. Double rub. Most fabrics come with a double rub rating. The SUTHERLAND® 2000™ Rub Tester machine is used to rate textile durability according to its strength and ability to resist tear after several washes. For residential use, 15,000 double rubs are considered an adequate score, while 30,000 double rubs are preferred for heavy-duty fabric to be used in commercial areas. A double rub is basically the back and forth rubbing motion that one would usually apply when washing the fabric. It determines how the material reacts to friction and how long it will last before the material gives in. The weave. Another thing that could tell you about the durability of fabric is the weave balance. If the patterns and yarns are of the same size, they will wear out better than those of different sizes. Fabric prevents us from being overexposed to the UV rays of the sun. The more closely-knit the fabric, the more protection it offers from the destructive rays. Do you know that the cotton t-shirt you have on is UPF 7? It protects you from the damaging ultraviolet rays to some extent, but you can do even better. Sun-blocking clothing items offer UPF 30 protection and above. They are gaining momentum as the world becomes more educated about keeping safe from the sun’s harmful rays. Be sure that your textile durability ratings are up to industry standards. The SUTHERLAND® 2000™ Rub Tester has an established reputation for providing an exceptionally qualified rub testing product. Contact us today for more information!